It's time to announce our July winners! What a wonderful response to our July challenges. One of you will be contacted and invited to be our Guest Designer for the month of September! with July Winner in the subject line and we will get your prize sent out to you!!!! 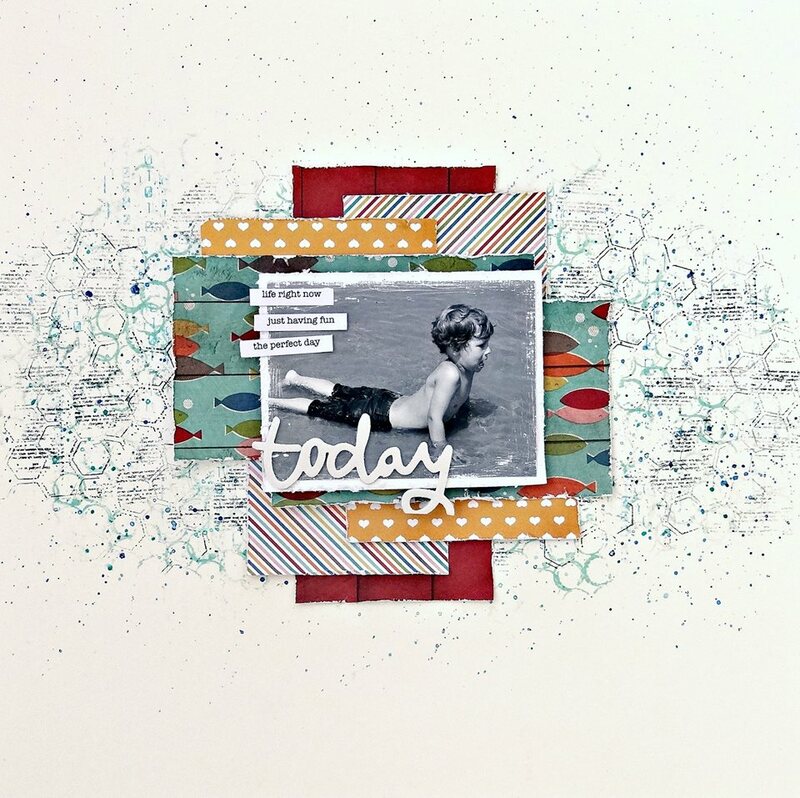 "I fell in love with the paper collection from PhotoPlay Paper and couldn't wait to cut into it. I stayed pretty true to the sketch except for a few little changes. For the stash part of this challenge I used: List 1 - Stick pin, List 2 - Twine and List 3 - Ultramarine (blue) color." You still have until 11:59 PM (PST) tonight to create a layout and link it up with us to enter into this month's prize drawing! I hope you get a chance to scrap today and play along. The team loves seeing what our fans and friends create inspired by our monthly challenges. "Hello scrappers! 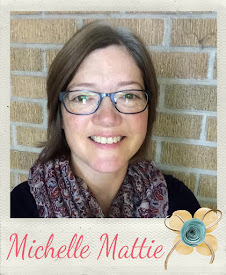 Rachelle here today so excited to share my design project for this challenge. I started off with the awesome sketch then I started blending the background. Next I applied the layers of paper, stamps,and washi tape. Now it's time to center the pictures and finish off with the embellishments. VOLI'A a complete layout! 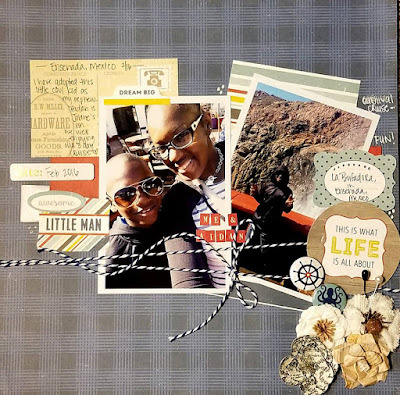 I hope you have been inspired to create and show us your layout project. Here's a look at the challenge! Inspired by Rachelle's layout and/or the challenge? Enjoy the rest of your day and return tomorrow for more Design Team inspiration! 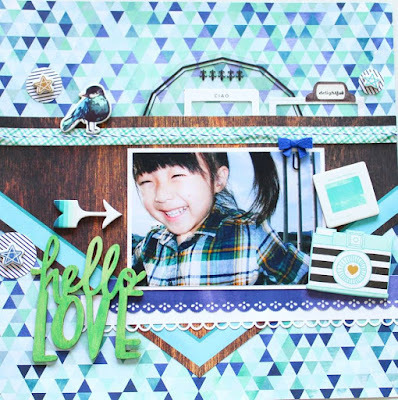 "I dug deep into my stash for this layout... Any ideas where those products come from? Let's go back to 2009, when Crate Paper came out with this fun Christmas line. Remember? Yes! 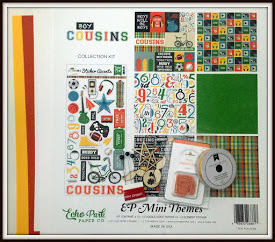 It's Crate Paper's North Pole collection!! I've been hoarding that collection since it first came out. Imagine! With that cute pic of my sweet daugther, Éloïse, it was the perfect time to use it, don't you think? Patterned papers, brads, rubons, die-cuts, chipboard pieces and sticker elements - the sky was the limit with this collection matched with Rochelle's sketch. 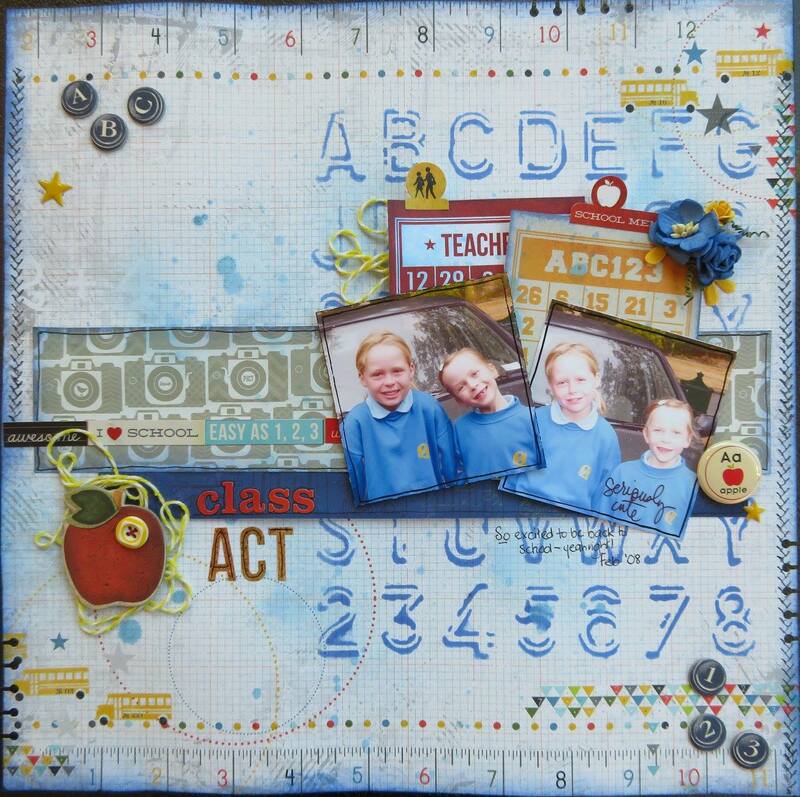 Set on a a 12X12 piece of Close to My Heart cardstock, I also used some Prima and October Afternoon alphas as well as some Tattered Angels Glimmer Glaze. And that stitched title? I used an old Bazzill Basics alpha stitching template along with some good ol' DMC floss - two strands instead of my usual single strand hand-stitching. Oh! And what elements did I use from the three lists? 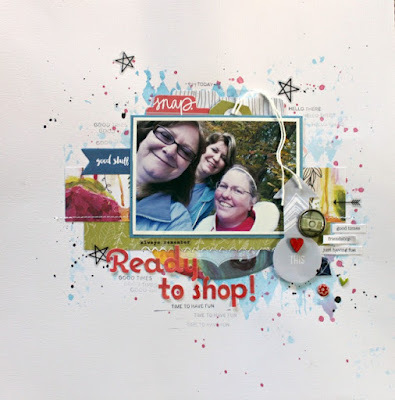 A Maya Road star stick pin, Stampin' Up baker's twine and journalling using a Uniball Pen. Hope you're inspired to start using those collections and items you've had in your scrappy stash for the longest time. Happy scrapping!" 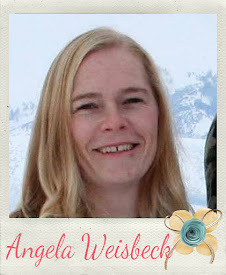 If you are inspired by the Aurelie's layout & are interested in playing along, you still have time! Thanks for stopping by & have a wonderful day! "This layout is of me and one of my best crafty friends son, while we were vacationing and visiting Ensenada. I usually use black or white cardstock as my background, so using this blue was a little challenging. For my items used, I used the following: 1.) Stick Pin, 2.) Twine, & 3.) Uniball (white) Pen. 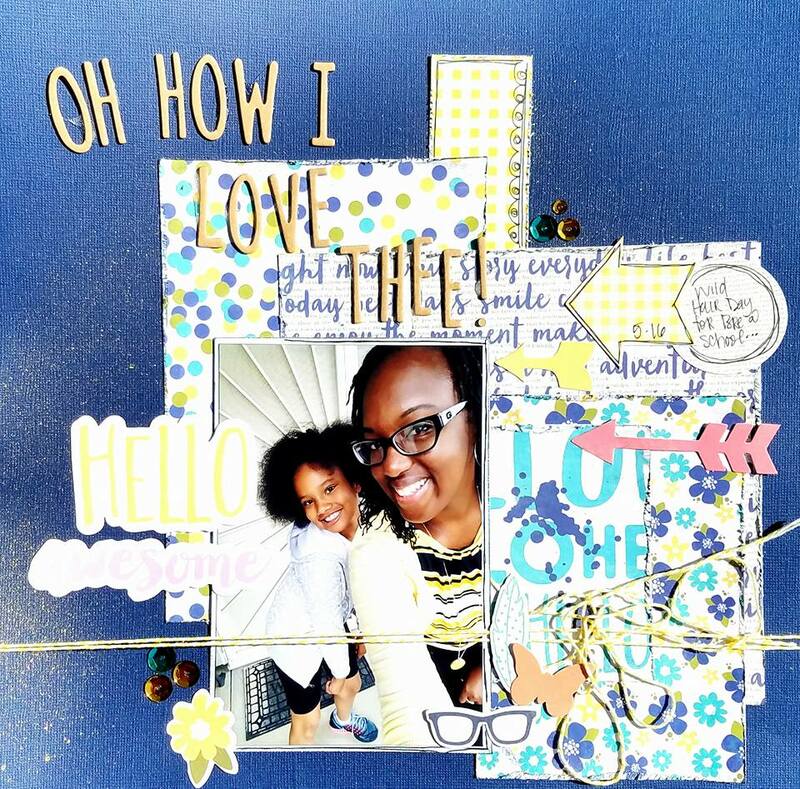 Can't wait to see more awesome layouts!" "From the three lists, I've chose Simple Stories, Timberwolf and Ultramarine. I went for a minimal clean and simple layout leaving a lot of white space around my picture. 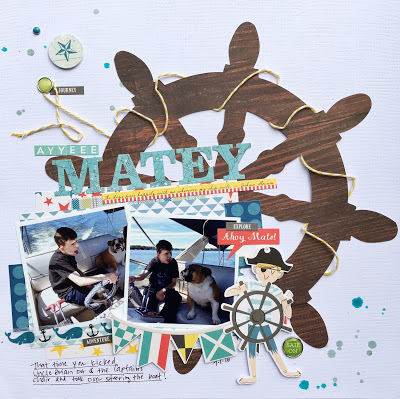 The Simple Stories papers were perfect for this beach picture of my youngest son. I've had this collection for a couple of years and it was pratically unused." Enjoy the rest of your day and stop by tomorrow to check out what our next designer has created to share with you! 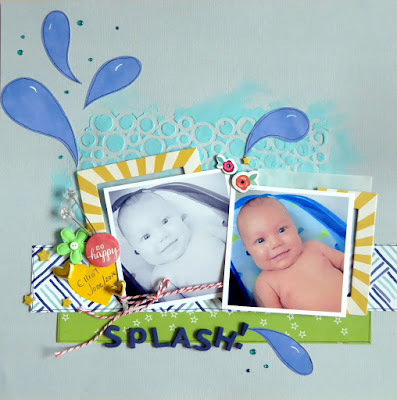 "I loved this sketch and it was perfect for these two pictures of me and Sienna! From the list- I picked Sangria, Timberwolves and Uni ball pen! I had a difficult time with the lists- but somehow managed to challenge myself to use what I could to pull it together! I can't wait to see what you guys come up with in this challenge!!" Our team would love to see how this challenge inspires you. You have until July 29th, 11:59 PM (PST) to link up your entries! 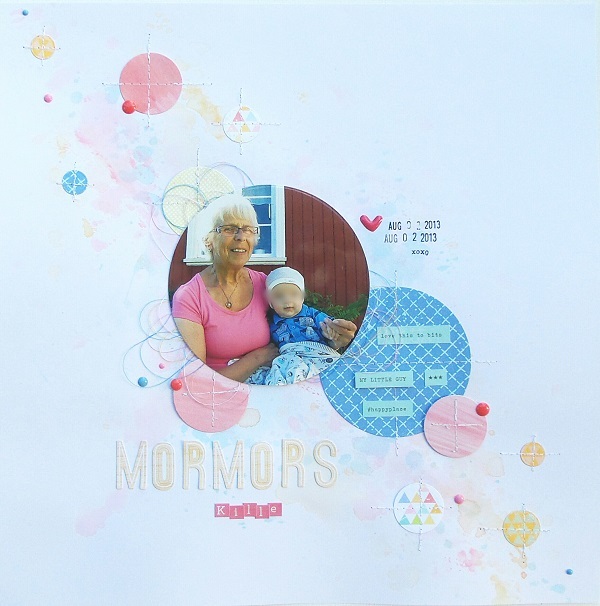 "Hi, Åsa here today to share my layout for the Sketch +3 challenge. 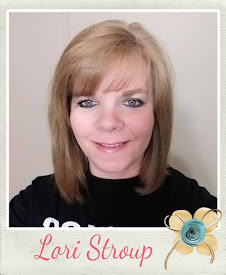 Hope I can inspire you to join us! I love that time when the apple trees are in bloom. Totally wonderful time with all the thousands of flowers. I use to take almost a thousand of pictures of the flowers and this is one of them. Hope you enjoy it as much as I do. 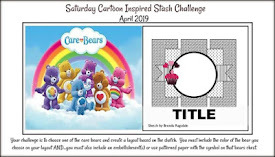 Take some time and join us for this fun challenge! Can´t wait to see your work!" 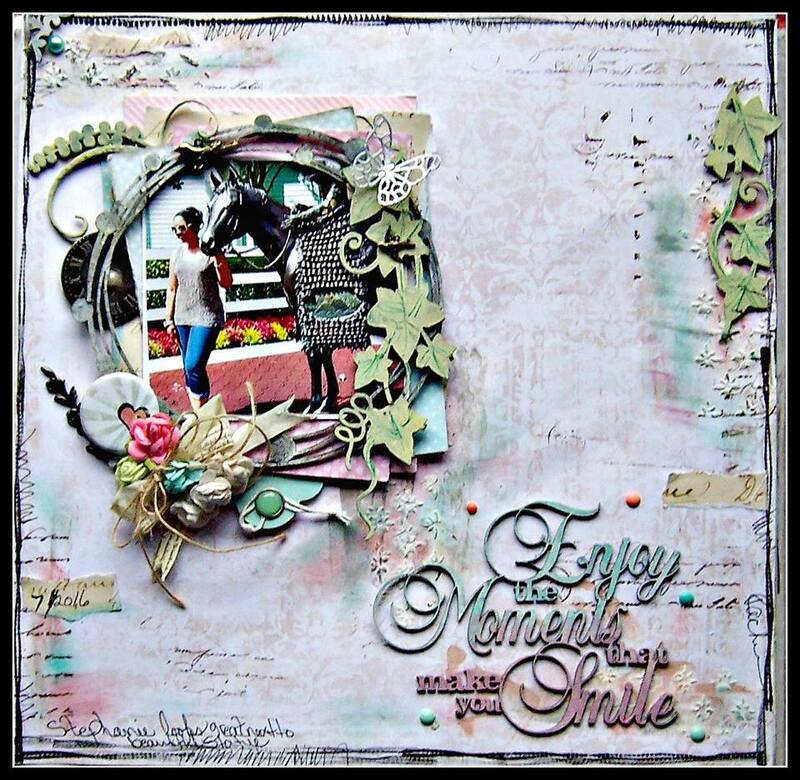 Here is the challenge that inspired her layout. Thanks so much for visiting today, I hope you've been inspired by Asa's layout and/or this month's sketch challenge. Have a great day and return tomorrow for more SOS Designer inspiration! Good morning and happy Friday friends! I "love this sketch - really adaptable - and hunting through my stash turned up sooo many things I'd forgotten I had...that's what so great about these challenges. From the lists I used Simple Stories (the chipboard and stickers), twine (which I love to just have poking out here and there), and Ultramarine (it's a great colour for my kid's primary school photos). Have a go at it - still plenty of time!" for the monthly prize drawing. Return tomorrow for more Sketch + (3) Design Team inspiration. Wishing everyone a day full of friendship, fun, and lots of laughter! 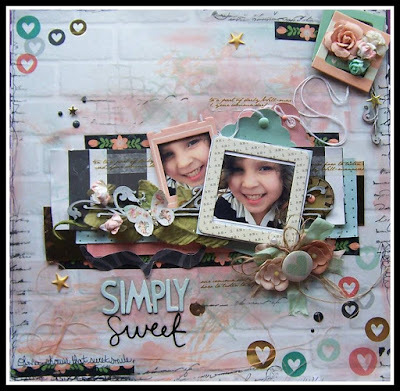 "Hello dear friends, Zsoka here with you today with a new layout for the sketch and stash challenge. Boy was this one difficult! I don't even know some of the things in the lists let alone have them in my stash :). So I went with the only things I had: Simple Stories (enamel dots and bradz), twine and blue (ultramarine)! I can't say enough how much I love these challenges because they really force me to look through what I have and use some of it! I can't wait to see what you all find in your stash and what you create with them! to be eligible for our prize drawing. "Hello friends!! I just love the sketch! So many options! I went thru my stash and choose from List 1: Stick pin, List 2: Twine and from List 3: Uniball pen and Ultramarine for the splashes. 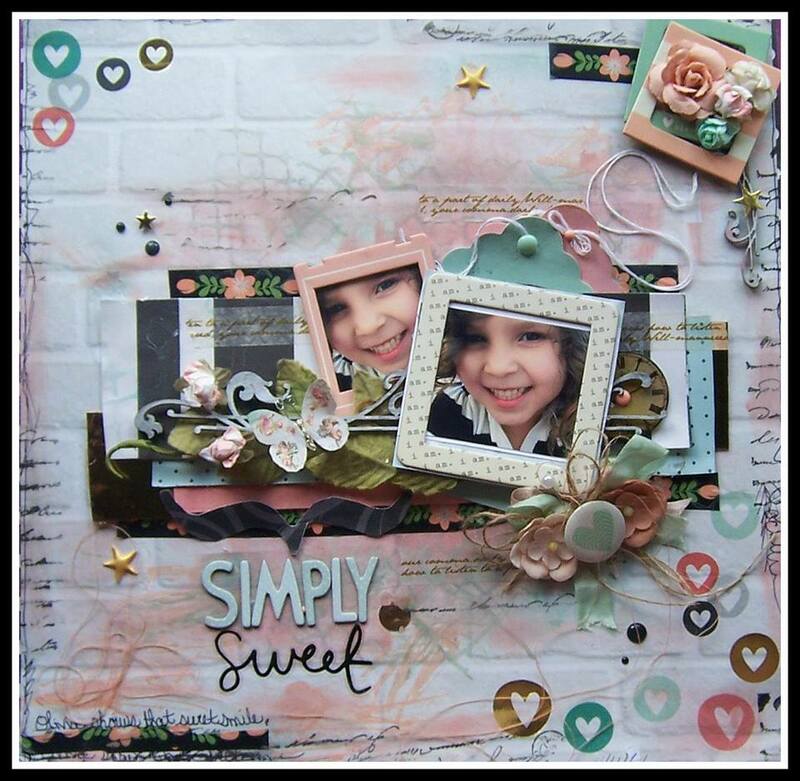 I also use some modeling paste mixed with mist to do my background, add vellum behind the photos and a few embellishments." The team would love to see how this challenge inspires you! You have until July 29th, 11:59 (PM) PST to link up your entries. Sketch + (3) inspiration from another one of our talented designers! "Hi everyone! 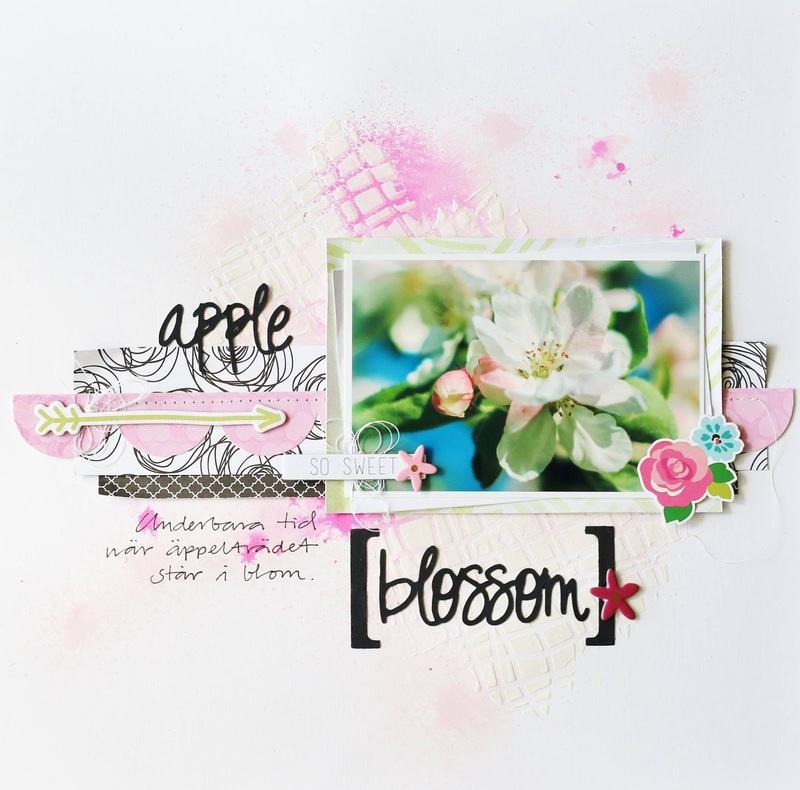 I hope this month's Sketch +3 Challenge, and my layout help to inspire you to play along! I love these Challenges! They really help you to dig into your stash, and sometimes find things you forgot you had!! LOL! 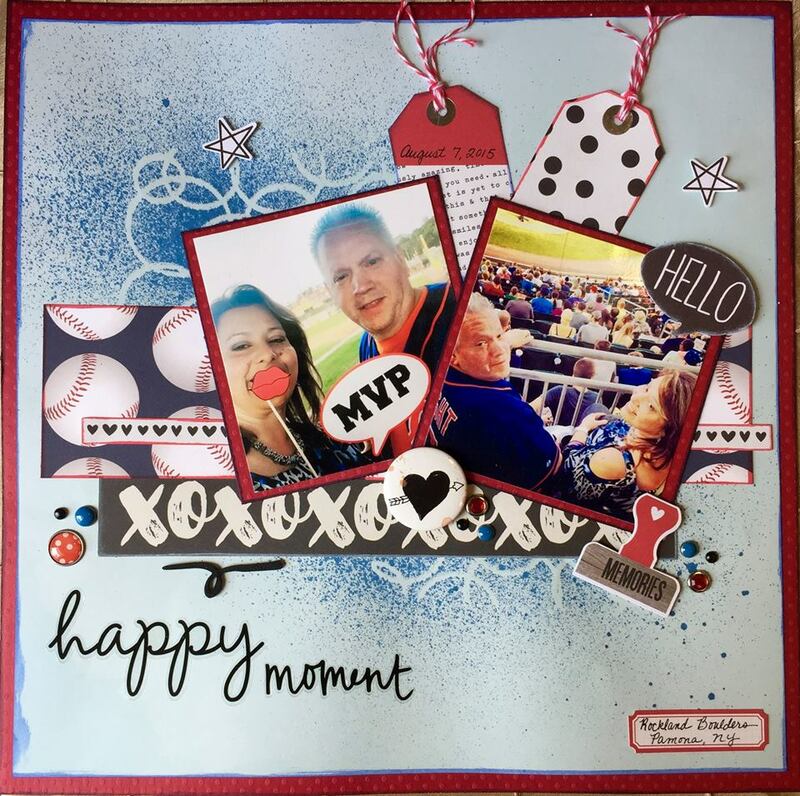 I used 2 photos from a minor league baseball game my hubby and I attend with a group of friends last year for this layout. We had a super fun time and I am glad I can capture and keep that memory forever with this page! I also used Bazzill "Phoenix" Cardstock for the "Sangria" item, and Ranger Distress Stain in Candied Apple, and Red jewel brads as well! List #3: I used a black Uniball Pen for journaling, along with a Ultramarine colored Glimmer Mist that I sprayed on the base page and some brads as well. Thanks for stopping by! 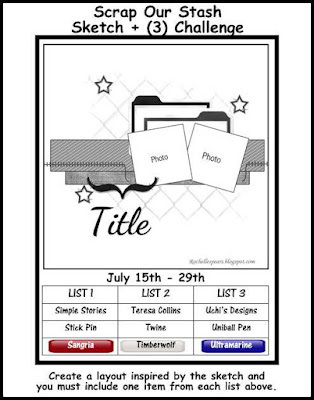 I hope you are inspired to play along with us this month!" 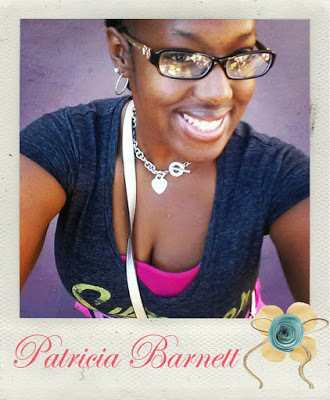 our next designer has created to inspire you! 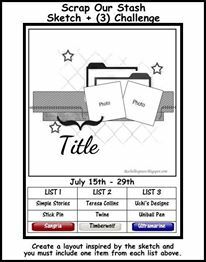 "I knew when I saw this sketch that those two index cards would be perfect to add some project life style cards to my page. 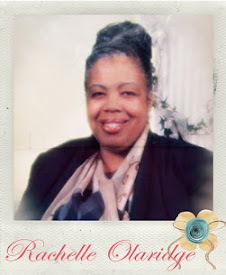 I replaced the two small photos with this single 4x6 photo. I also needed to move my title up on the page to make room for all my journaling. There was a story behind this snapshot that I really wanted to record. I then finished up the page with some embellishments. With the long title I thought that a the little banner flags with the same patterned paper would be a nice touch to draw your eyes up and across the page. For the lists I used: Simple Stories, Teresa Collins, Twine and Uniball Pen. I am looking forward to seeing your take on this challenge!" Using blue based colors was a new challenge for me, but I love how it turned out ! The shirt my daughter's wearing matches perfectly with the paper and I decided to keep the same tone by using embellies with similar colors. I painted the wooden title green because it stood out too much. 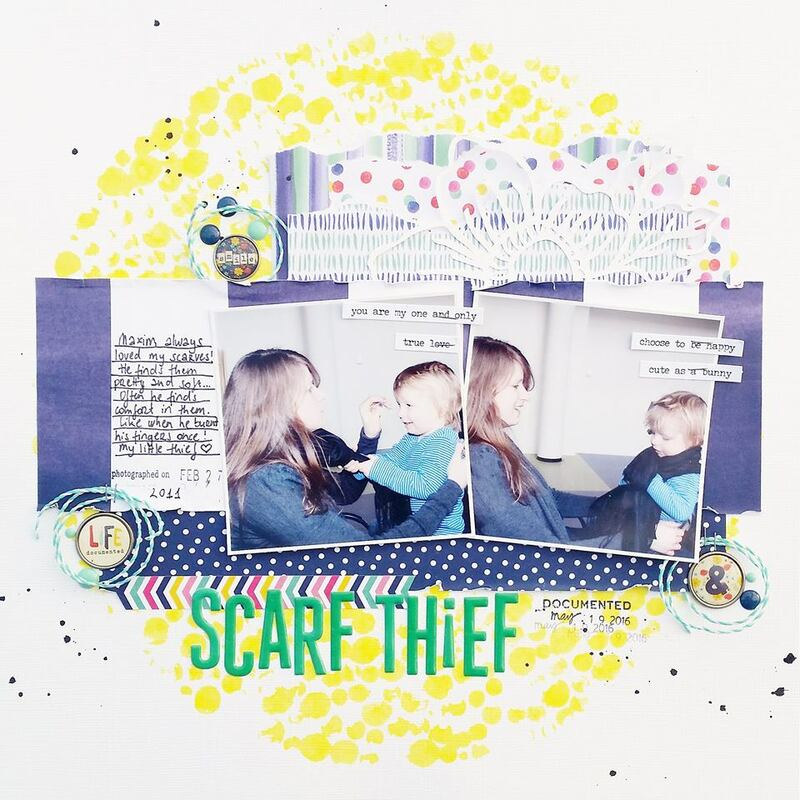 I usually make colorful OR chic layouts but I enjoyed making this one-tone layout !" 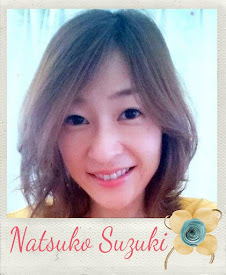 Inspired by Natsuko's layout and/or the challenge? provided, link it up by July 29th to be entered into this month's random prize drawing. "Hello! Steffanie here with a layout for the latest sketch + stash challenge! I love woodgrain...can I just say that? I really do. This one is especially nice giving that look of an old weathered fence. I couldn't resist using it as a backdrop to these photos taken of my son playing hide & seek in the tall grass at a local park. This sketch really appealed to me so I didn't vary from it much at all. The one change I did make was to move my photos and file folders to the left side rather than the right. The only reason that I even did this was because I wanted to use this cute "hello" speech bubble and it needed to go on the right. Easy move. I guess I also used all three colors but that was a matter of coincidence more than intent. 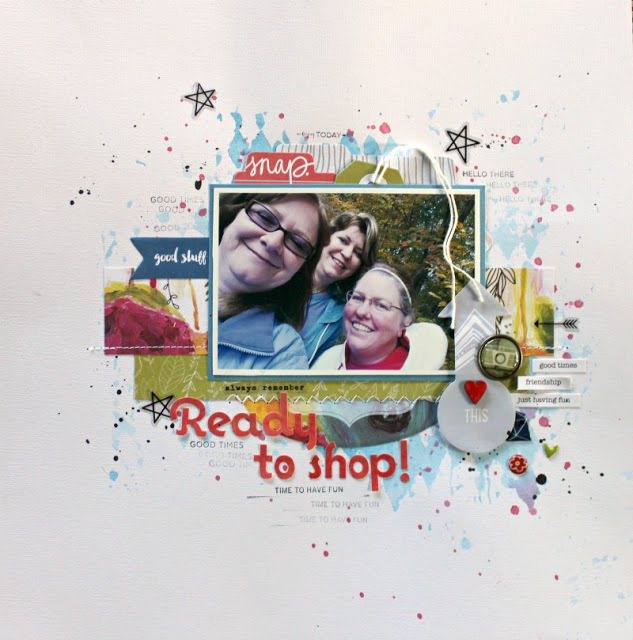 I hope I have inspired to you to get out some stash and get busy scrapping using this latest sketch. Be sure to share what you create!" July Sketch +3 Sketch Challenge! 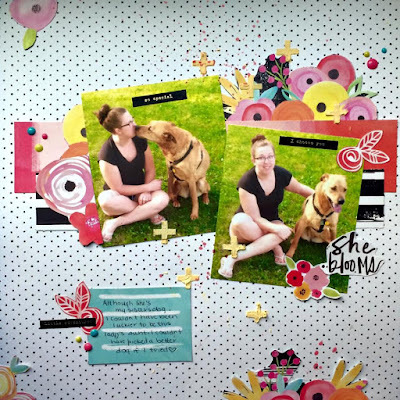 "I began this layout with the Fancy Pants Me-ology kit as it has mini folders that I had no idea how to use. From there I chose two pictures that would match. I used Simple Stories frames, twine around the quote at the bottom and a Uniball pen for the journaling. I really thought a lot about the background as I have some awesome Teresa Collins stencils but after making my cluster, I decided to sew the background like the picture. I'm so glad I did because I never would've come up with this idea without the sketch. I found some tags I liked in the kit so I had to move the title for balance. It is from Creative Embellishments with some black embossing. 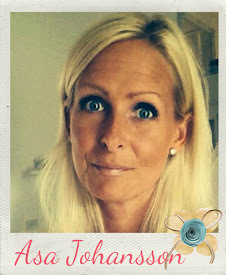 Thank-you - I've enjoyed being a guest designer this month! 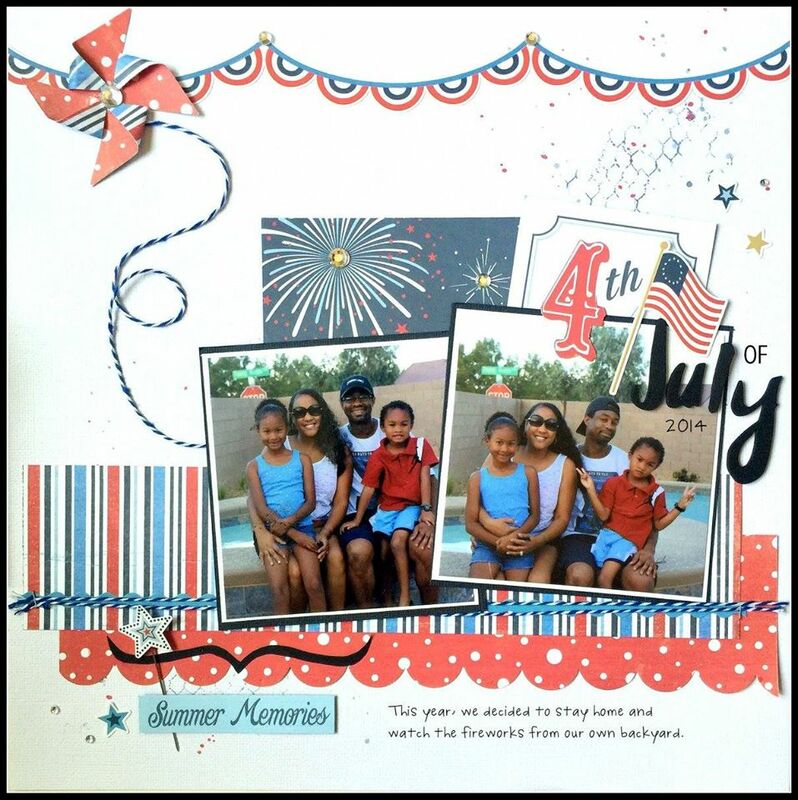 Make sure you upload your layout on the side bar before July 29th! I hope you have enjoyed getting to know a little bit more about each of our talented designers! 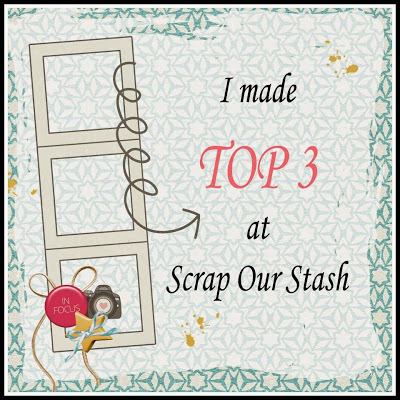 Rachelle is celebrating her third term with Scrap Our Stash and we are excited she has agreed to design with us another term. We're looking forward to the beautiful inspiration she will be sharing with us the next six months. "Hi there. 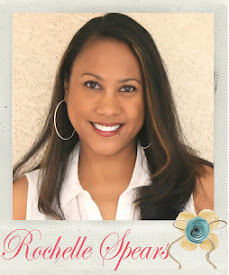 My name is Rachelle.I am a mother to 2 grown sons and grandmother to 2 beautiful grandchildren. I was a 6th grade teacher for 7 years. As a result of failing health I am wheelchair bound and keeping busy is still my goal. Scrapbook is the best and rewarding therapy. I started scrapbooking in 2008 when I viewed a friends work. My passion quickly turned into addiction for this type of artistry and I never looked back. I am very passionate about this interest. It's not just about creating albums but it is a work of art. I truly love the art of design in all aspects of life, Thus, here I am today enjoying my passion as therapy and inspiration for others. Each day is filled with being inspired, creating, providing inspiration through my work and treasuring the memories. I define my style using one word it would be Shabby Chic." I love beautifully embellished projects with lots and lots of detail. My love of flowers is reflected on most of my projects. I always have the urge to add a flower here or there. Although this is my true style, I easily adapt my style depending on the type of project. I love using a variety of techniques, elegant and fun elements. My style has been described as detailed, beautiful, and multifaceted. My greatest strength is attention to detail. I like to take the viewer on a visual journey of my inspirational designs. "Hi there scrappers. 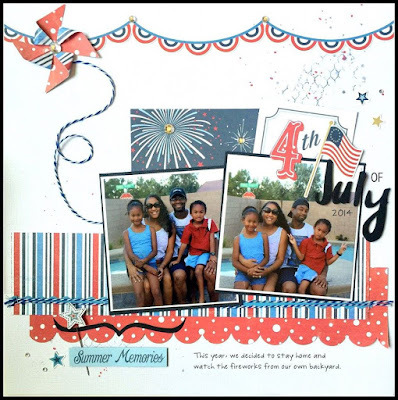 Rachelle here sharing my LO design for this challenge. I love using layers so I placed 5 layers of pattern paper behind the photo. I added a chipboard circle over the picture. Then I added a bit of mixed media to the background. Lastly, I added a small flower cluster, metal and chipboard pieces. Lot's of fun to do! 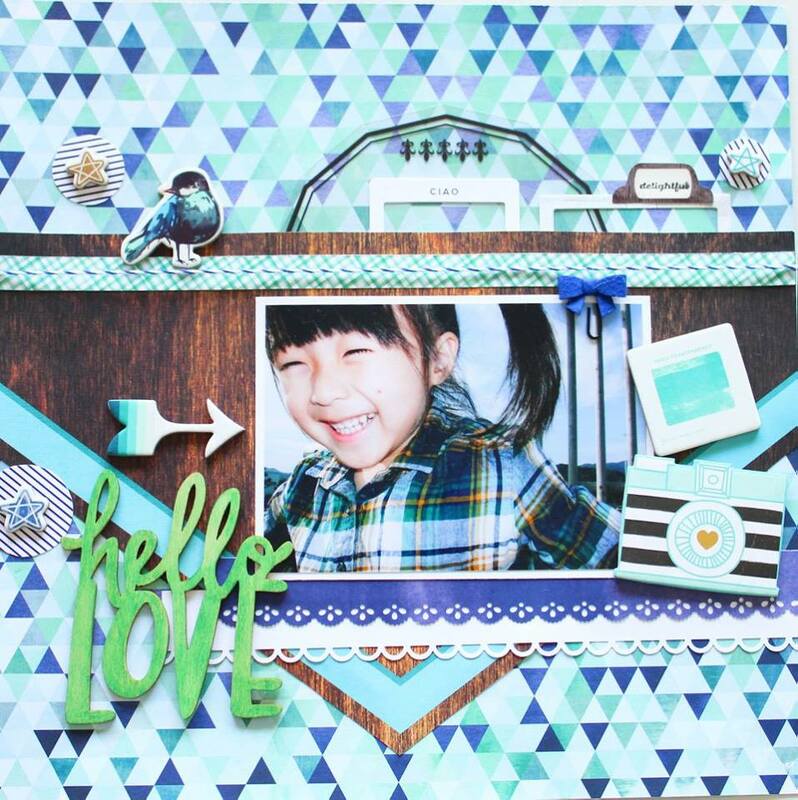 Now it's your turn to show us your creative LO! Can't wait to see it. " 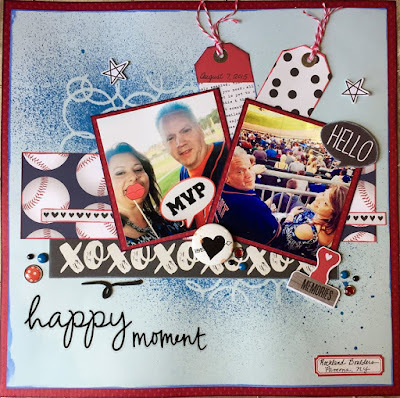 our July GDT Carolyn Johnson created inspired by the challenge. 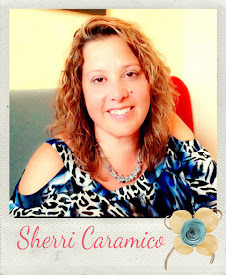 Hello and welcome to another day of our Design Team Introductions!!! 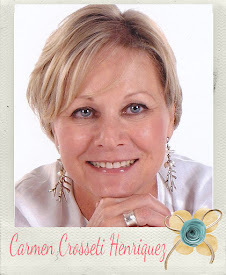 "I originally hail from Cheticamp, a beautiful Acadian village right on the Cabot Trail in Cape Breton, Nova Scotia. Studying in Moncton, I quickly fell in love with New Brunswick and have been a permanent resident since 2005. I now reside in Dieppe with my husband, Mathieu, our almost eight-year old son, Louis-Olivier, our two-and-a-half year old daughter, Éloïse, and our cat, Caillou. Since 2007, I am a public servant by day and a full-fledged scrapper by night. Scrapbooking has become an integral part of my life. 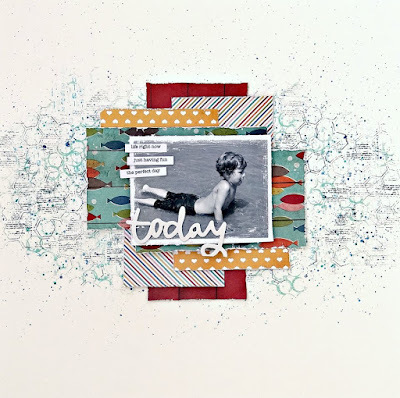 I try doing something scrapbook-related every day, may it be working on a layout, browsing through online galleries or catching up on my favorite scrappy blogs. 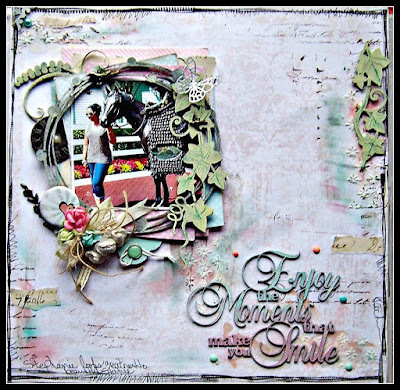 Published in a few editions of Canadian Scrapbooker, in France's own Histoires de Pages, and most recently in Scrapbook & Cards Today, my style has been known to be called "rustic", which is fine by me as it enables me to relish in fattening things up with layers, dimension, tearing and texture. Other than scrapbooking, I have rekindled a romance with reading through a monthly book club I joined at work in February 2012. 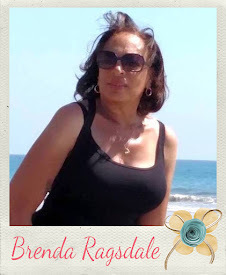 I also tutor, teach voice classes and sing most weekends at a few church services around the area." 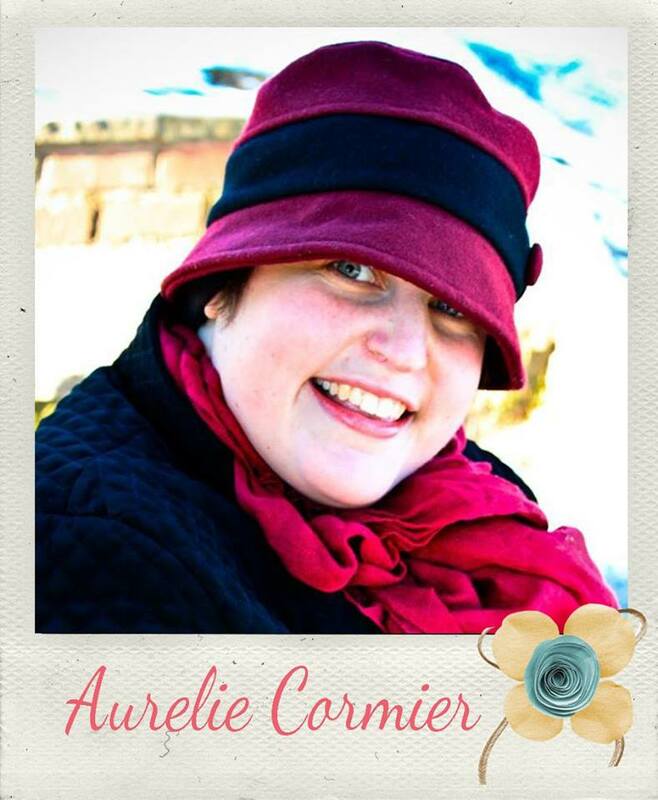 And here is Aurelie's first SOS Design Team reveal. 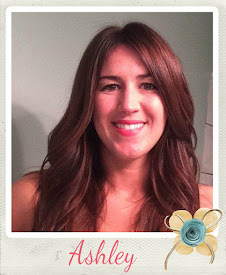 "SO excited to share my very first SOS reveal with you all!! 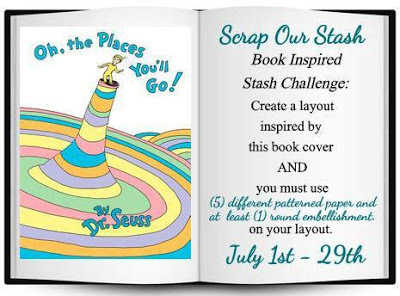 As soon as I saw this book cover challenge, my eye was immediately drawn to one thing - the color scheme. 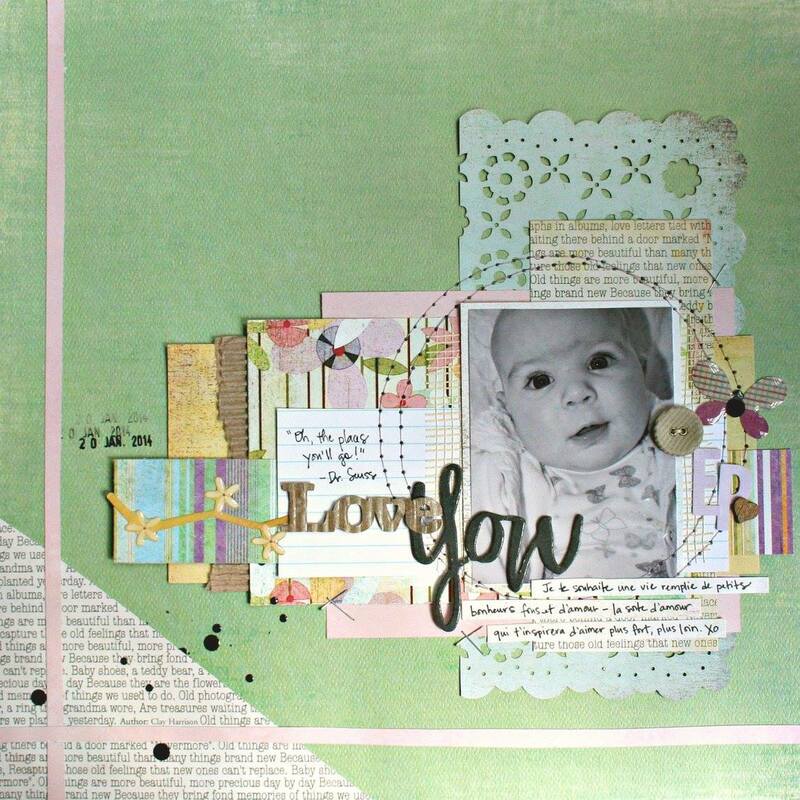 It brought me way back to my early days of scrapbooking and to a specific Basic Grey collection, Kioshi (c. 2009). Remember that one? ;) And for me, playing with at least 5 different patterned papers was right up my alley. 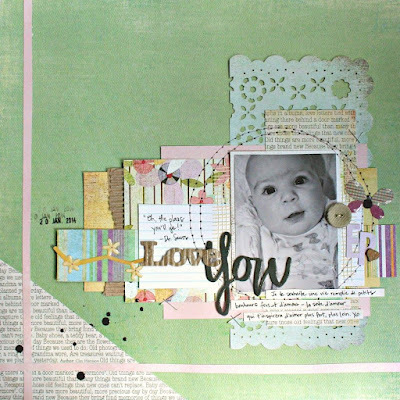 Layering is actually one of my favorite scrappy things to do! How many pieces do I have on this layout? Let me count for you... 1, 2, 3... Wowzers! A whole whopping NINE!! I not only coordinated the Basic Grey patterned papers, but I also added a few other pieces by My Mind's Eye and Ruby Rock-It. And that piece of ruled paper? I've had that in my stash from my very first years of scrapbooking, but I have no idea who manufactured it. Would L-O-V-E to find some more, though... Hee!Hee! ;) What else did I add on my layout? 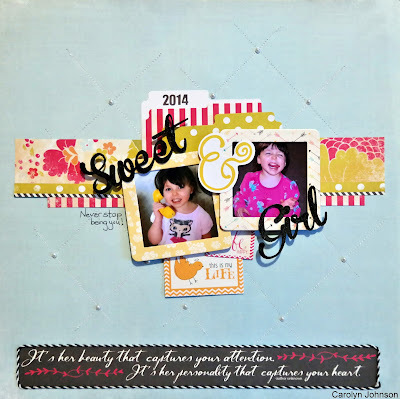 A Stampin' Up corduroy button (my round embellishment for this challenge! ), puffy stickers and alphas from Basic Grey's Kioshi collection, title elements by Jillibean Soup (I lightly painted that one with some Shimmerz Dazzlerz) and American Crafts, a heart-shaped wood veneer piece by Studio Calico, Making Memory staples, ink splats using Tattered Angels Glimmer Glaze, and good ol' fashioned hand-stitching using a Bazzill Basic stitching template and some DMC floss. And finally, I couldn't help but adding the title of the book as part of my journalling for my sweet girl - "Oh, the places you'll go!" Indeed. 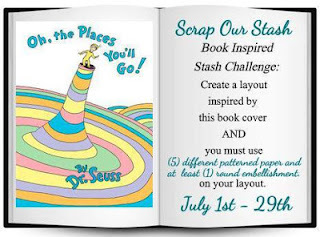 Hope I inspired you to dig deep in your stashes to finds some true treasures to use for this challenge. 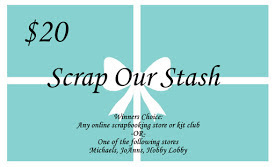 Happy scrapping!" tomorrow, so we hope to see you again tomorrow. 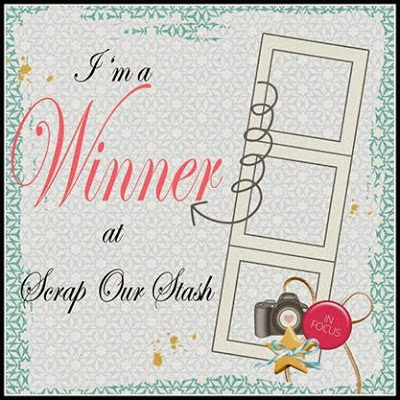 Patricia is celebrating her eight term with Scrap Our Stash!!! 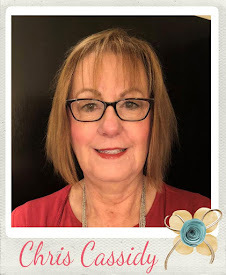 My name is Tricia and I am from Sunny Southern California, mother of one beautiful daughter Breanna Nichole (9) and I have a wild spunky dramatic Boxer named KoKo! 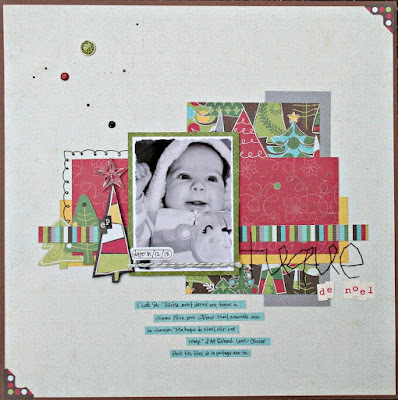 I have been scrapbooking for about 20 years and have enjoyed every moment of it. 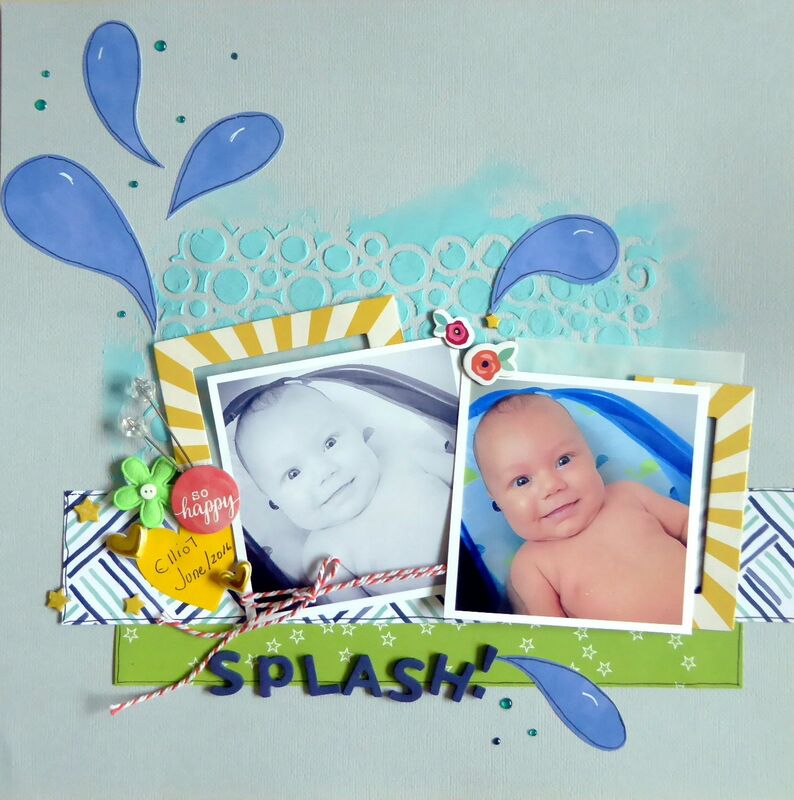 I began scrapbooking right about the time when there weren’t too many “safe” products out there to use. 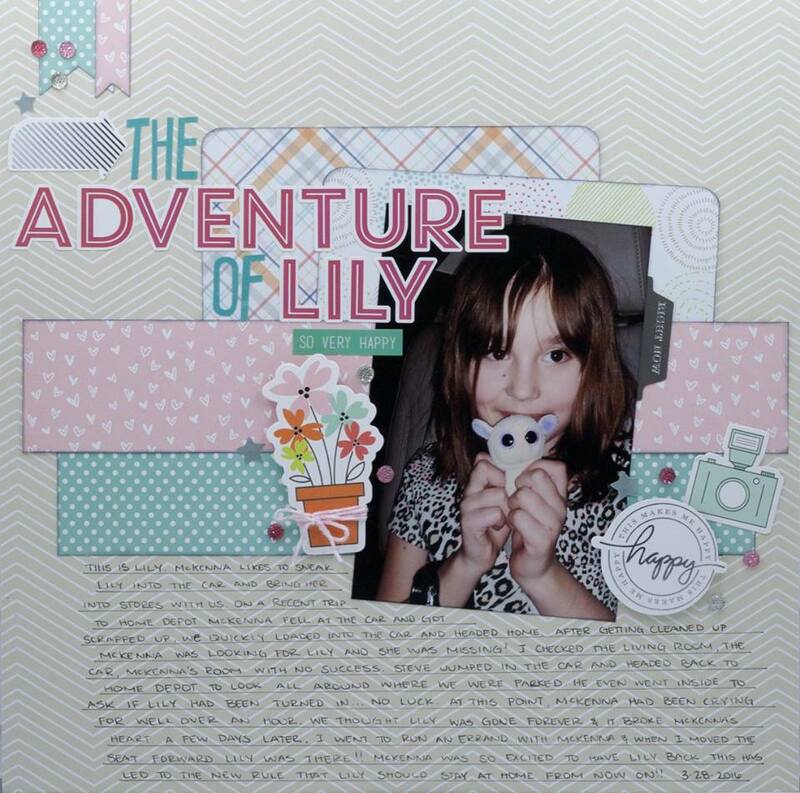 Since my attendance to a Scrapbook Expo it went all downhill from there! I usually reference that as my “coming out party!” Most of my projects and layouts you will see will be of my family and friends as I enjoy all the time I spend with them. 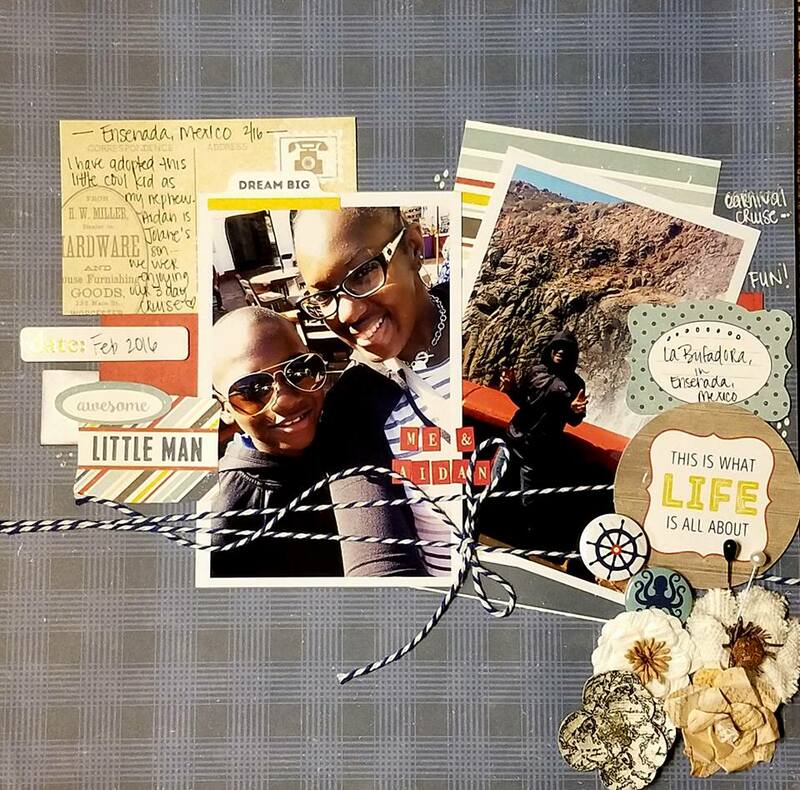 Scrapbooking has and always be a passion of mine and I am so excited to have met some rather awesome people that maintain a positive healthy friendship with! Crafters ARE the coolest people around! Besides crafting, I love spending time with my family, friends, traveling, reading, dancing and working out. I am usually never still and always involved in something. 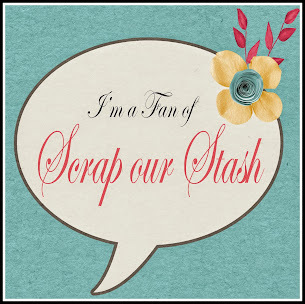 I am super excited to be able to continue being on the Design Team for Scrap Our Stash! All the designers are extremely talented and I am sure you will find inspiration every time you visit! I am totally looking forward to another term and I hope you are too! Stay tuned to see some cool stuff! "Oh How I Love Thee"
"This was a fun challenge as I already enjoy using the layering technique. 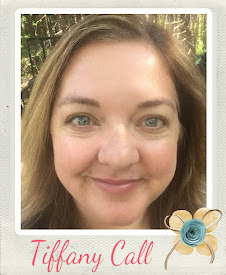 I used papers from the "Jillibean Soup, Healthy Hello Soup" collection. I got inspiration from the book cover title, "Oh The Places We Will Go" and changed it to "Oh How I Love Thee!" Click HERE for challenge details and rules!!! and to see the inspiration she created to share with us!